When you notice that someone might have memory issues or there are signs that their mental function seems “off,” you might assume that they have dementia. But even if other family and friends notice some changes, the symptoms usually aren’t severe enough to cause problems with your older adult’s everyday life. The issues could be caused by mild cognitive impairment (MCI). It causes memory and thinking problems beyond what’s normal for older adults and affects 10 – 15% of seniors. We explain what mild cognitive impairment is, the symptoms, how it’s diagnosed, causes and risk factors, and treatments. Healthy people experience a slow decline in cognitive abilities as a normal part of aging. Mild cognitive impairment (MCI) is a middle stage between the occasional forgetfulness of normal aging and the serious cognitive decline of dementia. It can cause problems with memory, language, thinking, and judgment. People with MCI have a higher risk of developing dementia. About 1 – 2% of seniors develop dementia every year. Among seniors with MCI, about 10 – 15% develop dementia every year. But in some cases, mild cognitive impairment doesn’t worsen over time. Some people with MCI may even improve over time. And in other cases, their symptoms might be stable and stay about the same. These changes may cause someone with MCI to need a little help with the more difficult everyday tasks (like paying bills, managing medication, driving). 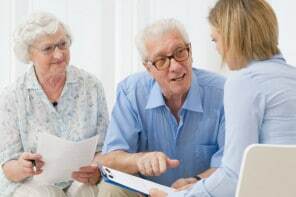 The benefit to a proper MCI diagnosis is that your older adult will know that their cognitive issues aren’t caused by a medication side effect or other treatable conditions that cause dementia-like symptoms and could be mistaken for MCI. Plus, they’ll know if they have an increased risk of developing dementia. That means doctors can monitor them regularly so if they do develop dementia, they can be diagnosed and treated as early as possible for maximum effectiveness. Diagnosing MCI is the same as diagnosing dementia. The causes of mild cognitive impairment aren’t well understood. Experts believe that many cases (but not all) are caused by brain changes that happen in the very early stages of Alzheimer’s disease or other dementias. There are no FDA-approved medications that treat mild cognitive impairment. Drugs that are approved to treat Alzheimer’s disease haven’t shown any benefit in delaying or preventing progression of MCI to dementia. What is more helpful is to live a lifestyle that’s as healthy and balanced as possible to improve symptoms and lower the risk of dementia. Experts also recommend that a person diagnosed with MCI should be re-evaluated by their doctor every 6 months to monitor symptoms – stable, improving, or getting worse.